Alia Bhatt- 4 Outfits That Will Make You Want To Steal Her Wardrobe. Versatile and beautiful actress Alia Bhatt has been busy promoting her upcoming movie ‘Badrinath ki Dulhania’, she was spotted wearing four lovely outfits which will make you want to steal her wardrobe. Alia Bhatt was recently spotted at the Hindu college in Delhi along with her co-star Varun Dhawan. She was seen wearing a red top with same coloured pants. She has nailed the look with soft curls and minimal makeup. To further elevate the look she wore a red coloured scarf. Not everyone can pull off a combination of print and print look. But the gorgeous Alia Bhatt managed to pull off the look with grace. She was seen wearing a mixture of red and white lovely printed off shoulder top with straps paired with blue printed maxi shirt. 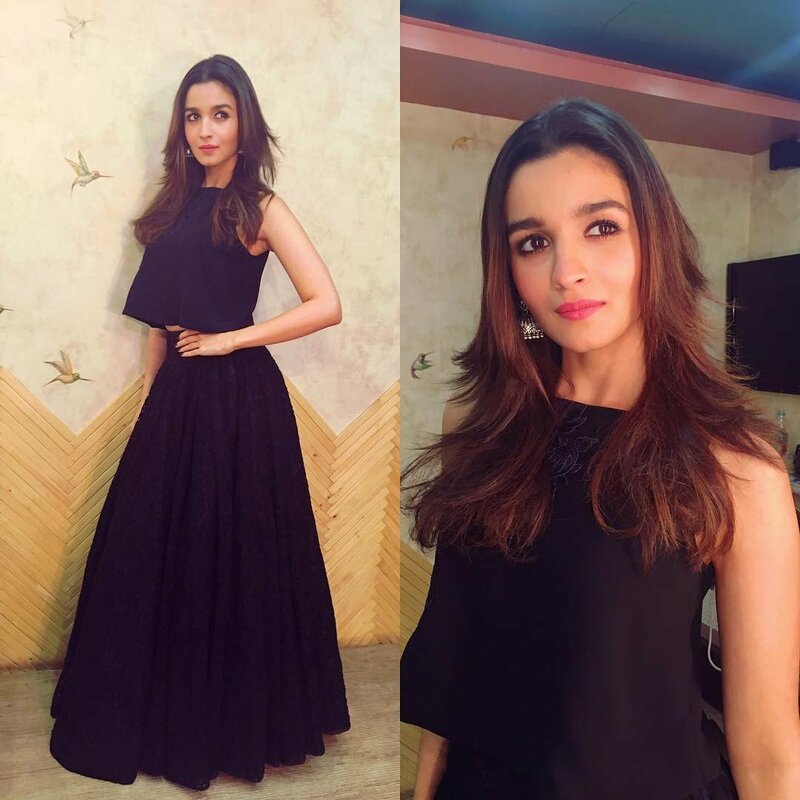 Alia Bhatt wore a cropped black top with a maxi shirt, she accessorised the dress with silver jhumkas. This black attire look was definitely a killer one. Alia Bhatt was spotted wearing a lovely off-white lehenga choli on the sets of ‘Dil Hai Hindustani’. The ‘Badrinath ki Dulhania ‘actress pulls off Indian and western attires with grace.